For my coming-of-age blog, I’m going to (possibly) start something of a miniseries that showcases two of my passions where they coalesce, Star Wars and tabletop gaming. There is a rich tradition here, of course, but I’m going to start in media res, as it were, and talk about one of the newest games to hit the shelves: the Star Wars LCG! First of all, a brief and vague history for you. Card games have been around for ages, of course, and collectible card games became really popular in the 90s, it seemed, with that juggernaut of them all, Magic the Gathering. I’ve never played Magic, and have never really felt a need to explore it. A lot of the mechanics of that game, though, were taken up by other games and have now become somewhat staples of card game play. There have, of course, been hundreds of collectible card games, where you buy packs of cards in a sort of blind-buy format, never knowing what you’re going to get in that particular booster. A collecting system usually also features some sort of gradient of rarity, making some cards very difficult to get hold of. Simple economics, and all that, to drive sales. However, as the 90s turned into the 00s, many folks became burned-out on the whole thing, and many are the shoeboxes-under-beds full of cards long regretted. Then a company comes along that reinvigorates the whole genre. Rather than a CCG, they make a LCG, or living card game. Gone is the blind-buy trauma, instead you get a fixed pack of 60 cards every month that continues to expand the game. That company? Fantasy Flight Games. Wonderful people, with (currently) five living card games (and one dead card game, and one embryonic card game). 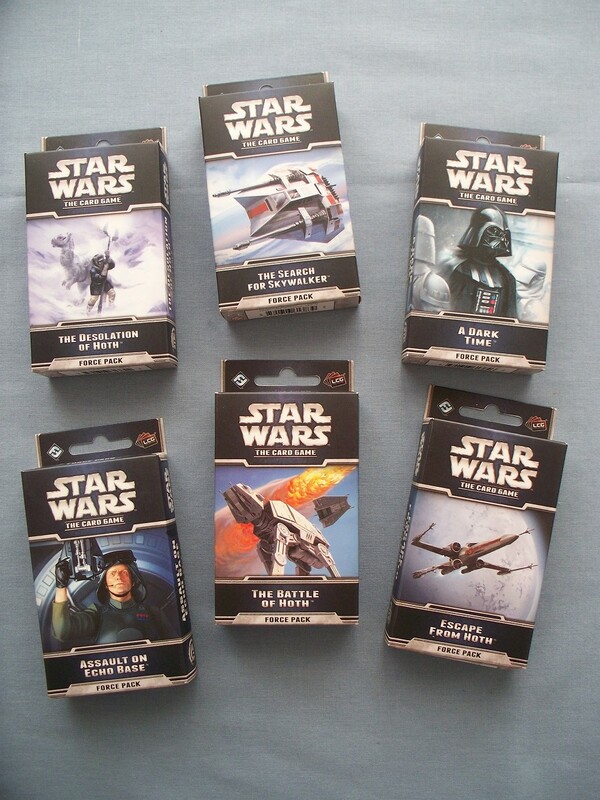 Fantasy Flight currently hold the licence to make Star Wars games, and at the end of 2012 they brought us Star Wars: The Card Game. I really like this game, but I haven’t yet found anyone who shares my enthusiasm. Consequently, I have only played it five times since its release, and while I have continued to buy the expansions, I have yet to play with any of the new cards. That fact, however, does not stop me from appreciating the growth of the game, nor does it put me off wanting to blog about it! All CCGs and their derivatives function in vaguely the same way – you build a deck of cards, often of a predetermined size, then use that deck in combat against someone else. Some games favour group play, some one-on-one; FFG produced the first fully co-operative game in 2011, Lord of the Rings, which is possibly my favourite of the lot, and will be the subject of a future blog. Star Wars went through some initial design changes until it became the one-vs-one game we have today, though a further expansion has added the option of multiplayer in certain circumstances. 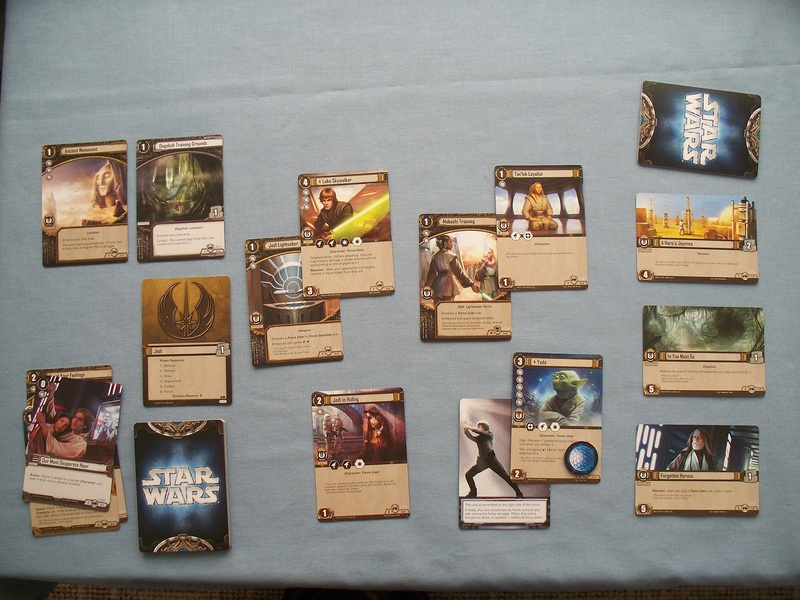 However, the deckbuilding process is a common theme to all such games, and Star Wars caused the most ripples with its innovative take on the process. See, most games allow you to build a deck according to certain restrictions, notably faction alignment and so forth, and restrictions of size, but otherwise you’re free to build this deck on a card-by-card basis. 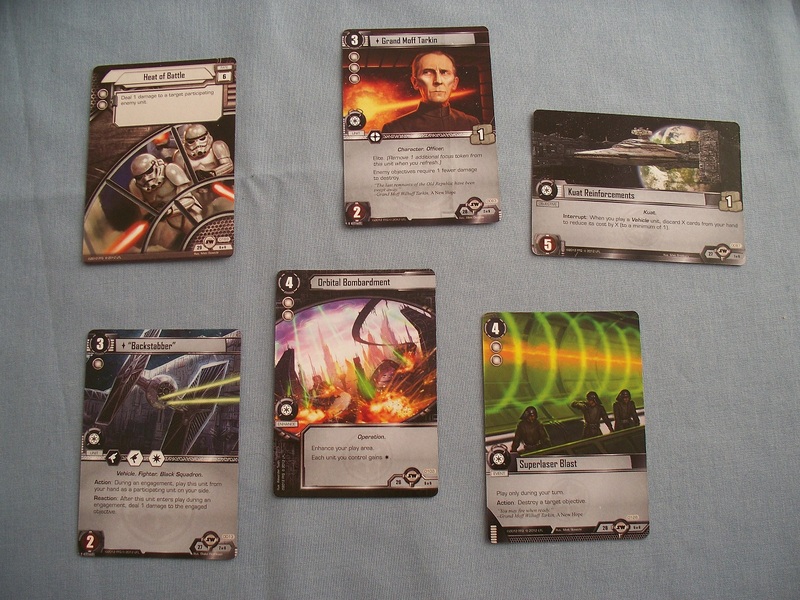 Star Wars radically alters that by using an “objective set” (or pod) system, whereby you choose at least ten objective cards, which are linked to a pod of five other cards; your objective cards thus determine your deck. I remember the furor this generated on the official forums prior to the game’s release, as veteran deckbuilders complained mostly about the “hand-holding” approach this brought to the game. However, since its release, and with the remove of nearly eighteen months of gameplay (if you’re lucky, of course! ), popular opinion has largely turned around and people are now appreciating the increased level of skill required to build a functioning deck when your choices are focused in this way. The cards in Star Wars come in a variety of types. Shown above are examples from the Imperial Navy faction. Clockwise from the top, we have Units (characters and vehicles, mostly); Objective cards; Event cards; Enhancement cards; Unit card again, and Fate cards. Another of the early criticisms was that Unit cards encompassed both characters and vehicles, which has led to the oft-quoted example of a Rancor monster battling a Super Star Destroyer. A lot of this stemmed from the fact that previous iterations of a Star Wars card game had ‘arenas of combat’, where ground-based forces were played in one arena, and spaceships were in another. In this game, however, your unit cards are meant to represent your might on the field of battle, making the game more a battle of wills than a direct-combat style of game. For the record, I have no problem with this manner of implementation – after all, it’s a game. Objective sets are six-card sets, as I explained. These sets can come with any sort of cards within them, not necessarily one of each type. Shown above is the set ‘Agent of the Emperor’, from the latest (at time of writing) expansion pack, Lure of the Dark Side. This is perhaps not the most indicative of sets, but it nevertheless demonstrates some of the synergy that is seen between the cards – something that was doubted quite strongly by the early critics. Many of the sets come with cards that would perhaps naturally have been put into players’ decks anyway, and do not “force you to take a chump card if you want a stronger card in your deck” and waste deck space. So what do all these cards do? The game has six factions: Jedi, Rebel Alliance, Smugglers and Spies, Sith, Imperial Navy, and Scum and Villainy. Further, the first three are Light-side affiliated, and the last three are Dark-side affiliated. You are allowed to mix factions, but not affiliations. The economy of the game is based on resources, and each faction card provides one resource (the small bundle of boxes with a “1” on the right hand side of the card). Objective cards also provide at least one resource, and in order to play a card of a specific faction, you must pay with at least one resource from that faction. Common deckbuilding wisdom, then, is to have a deck skewed towards one particular faction, with a secondary faction “splashed” in – as you will have three objectives at any one time available to provide your resources, it’s more expedient to use the splashed faction’s card. 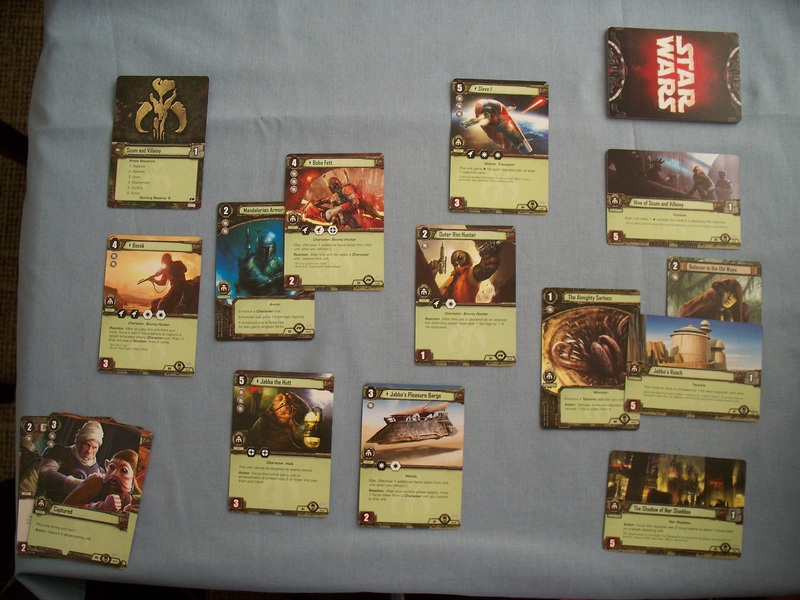 The play area, shown for an all-Jedi player above, shows the typical layout of a game in progress, with the objectives on the right, the play area in the centre, enhancement cards top left, and the deck and discard pile in the bottom left. The object of the game is different for each player. 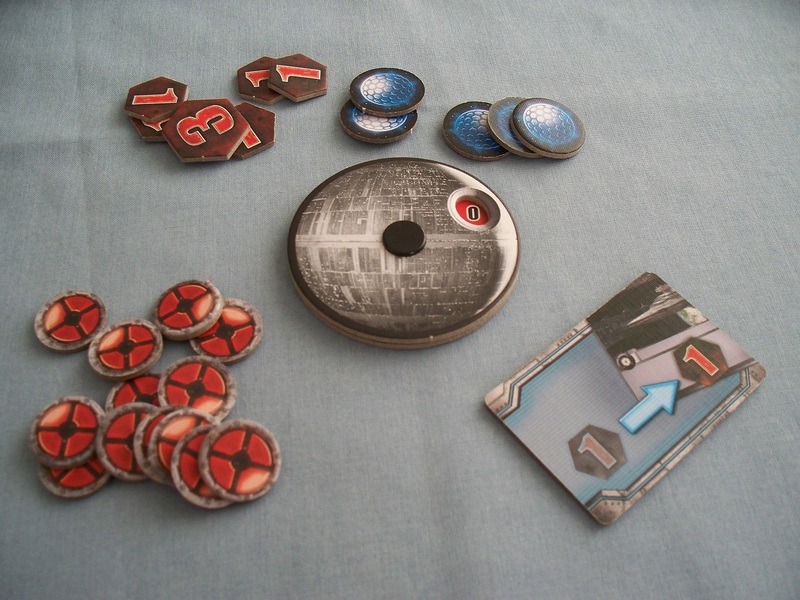 The Light-side player must damage three of his opponent’s objectives in order to win, while the Dark-side player must advance the Death Star dial to 12. This dial can be advanced in many ways, most easily at the beginning of each turn for the Dark-side player. The more objectives the Dark-side player destroys, however, the more clicks he can advance the dial by. Furthermore, there is a ‘Force struggle’ phase that I shall get onto shortly, and if the Force is with the Dark side, the dial also advances more per turn. The Dark-side player always goes first, so the pressure is really on from the first moment for the Light-side player, but there are a few tricks that can be employed to succeed. Perhaps the best among them is the Rebel Alliance enhancement card Trench Run, which allows the Light-side player to target the Death Star dial itself as if it were an objective: should the dial be destroyed, the Light side will win. The game really favours aggressive gameplay from the start. Unlike most card games I’ve played, where you need to amass resources and often don’t get to play your good cards until the mid-game point, Star Wars doesn’t really have a lot of expensive cards – Luke Skywalker, for instance, costs 4 resources, which is usually the minimum you’ll have available to you. If you draw him in your opening hand, you can play him in round one! There are a lot of things going on in this game, and it can sometimes appear a bit strange at first play. I feel that certainly has been one of the main barriers when I’ve tried to introduce other people to it, but unfortunately nobody has been willing to stick it out yet. For one, you don’t collect resources at the beginning of your turn, but instead you always have your resources “on”. When you use them, you place a focus token (those red things like a target to the bottom left of the DS dial in the above picture) on them. Then, at the beginning of your turn, you refresh these cards by removing one token from them. 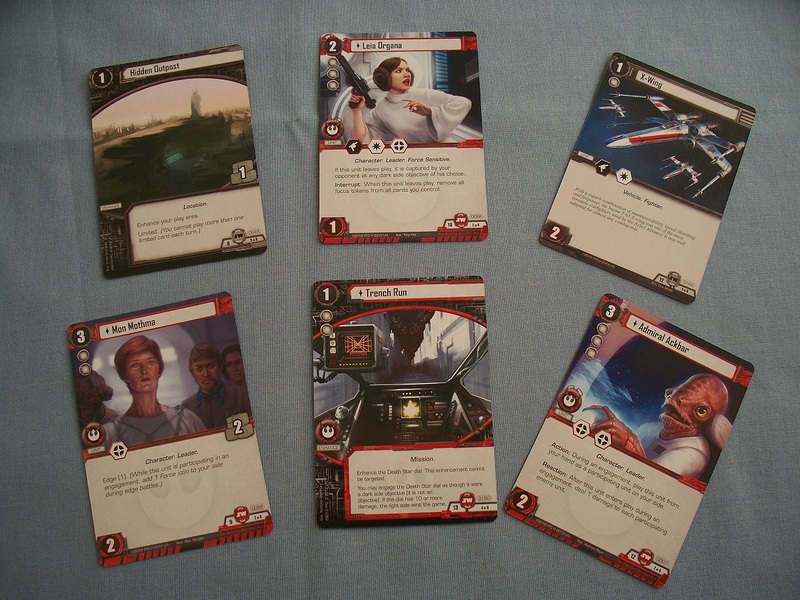 A lot of cards – such as Mon Mothma and Admiral Ackbar in the above picture of Rebel cards – have the focus symbol on them. There are three types of attack in the game: unit attacks, objective attacks, and focus attacks. On your turn, you declare your attack on your opponent’s objective by focusing the units you are going to use for that attack, and then begin an ‘Edge battle’. RPG players will know how important Initiative is for determining attack order, and the Edge battle is like rolling for Initiative there. You play any number of cards you like face down, one after another, until you both decide to pass. Then, you simultaneously reveal them. The number of white pips that are along the top left edge of the card are added up, and the winner ‘has the edge’ for that battle. The Fate cards shown earlier are only played during Edge battles, and can radically alter their outcome, sometimes forcing you to swap Edge stacks with your opponent, sometimes cancelling the battle altogether and forcing a new one. Whoever wins the edge strikes first, which is important because some characters have icons that are bordered in black and some in white (both Mon Mothma and Admiral Ackbar are in white only, you’ll note) – white icons only take effect if you won the Edge battle, otherwise a unit can potentially be useless. Unit attacks deal damage to participating units only; focus attacks allow you to place a focus token on your opponent’s card, and objective attacks deal one point of damage to an opponent’s objective. Unit attack damage is assigned by the defending player, but keywords like Targeted Strike allow the offending player to determine who will be damaged by the attack – useful if you want to wipe out a specific unit. Focus damage is used to make it more difficult for your opponent to use cards, either for their resources or in battle – unless a card has the Elite keyword, only one focus token will be removed. (Furthermore, if that unit is committed to the Force – explained shortly – you place two focus tokens on it to use it, making it even more difficult to bring it back into the game). Once the damage has been dealt to units, the person with the most surviving units is declared the victor – if that was the offensive player, one point of objective damage is dealt in addition to any blast damage units triggered. Furthermore, if you have one attacking unit left, with no defenders in your opponent’s area, the attack is considered unopposed, and you can do one extra point of objective damage. Objectives can only be attacked once per round, but damaged potentially multiple times. Once one fight is over, you can then declare another attack if you have unfocused units. If no further attack is declared, the Force struggle then begins. Players have the opportunity to commit one unit to the Force each round. 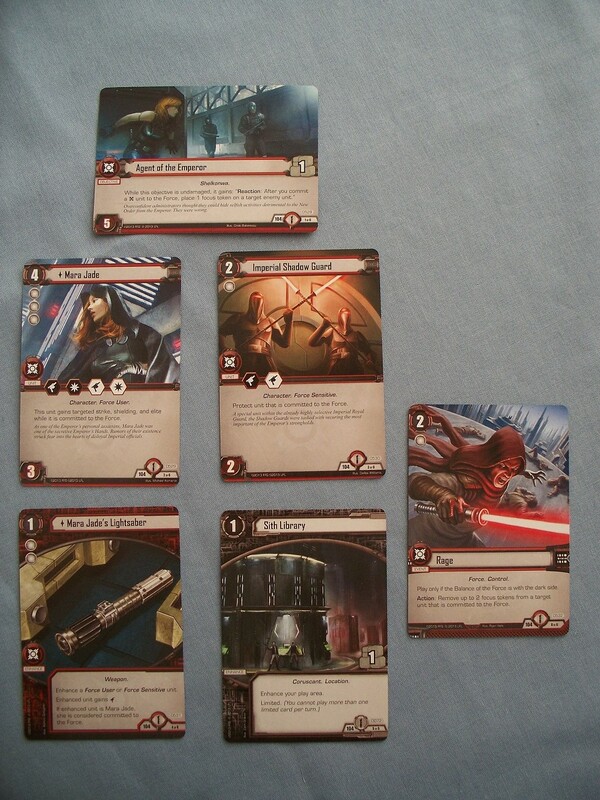 The pips on the left of the cards that determine Edge battle results also determine their strength in the Force, and the person with the highest number of pips on Force-committed characters in this phase wins the Force struggle. As shown in the Jedi player’s play area in the picture above, Yoda is committed to the Force as he has the card placed under him. Mentioned earlier, if the Dark-side player has the Force with him, at the start of his next turn he moves the Death Star dial one extra point. If the Force is with the Light-side player, however, he can deal one point of damage to one of his opponent’s objectives at the start of his next turn. It is a fairly simple game, in theory, but with a lot of tricks that you can get up to that will alter the flow of the game. Each faction additionally has a distinctive feel, with what I suppose you could call a distinctive trait to them. 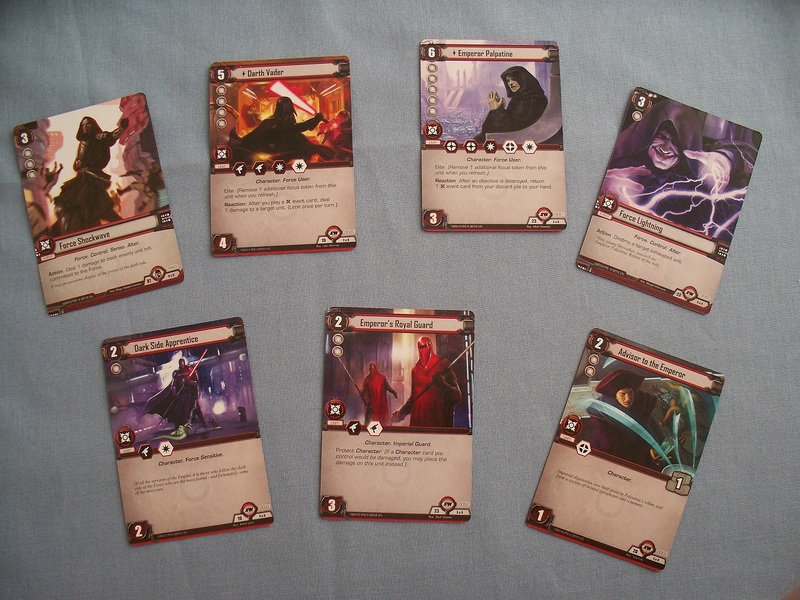 For instance, a lot of the Sith cards concentrate on burying your opponent under focus tokens, “locking down” the game while the dial creeps inexorably up to 12. The Imperial Navy is all about the damage, with event cards that allow you to destroy one of your opponent’s objectives straight off (the Death Star superlaser strikes!). The core set comes with four fully-playable factions, and one objective set for each of Smugglers and Spies, and Scum and Villainy. The deluxe expansion box Edge of Darkness was released a few months after the core set, and fleshed out these two so that they were on a par with the core factions. I quite like the fringe elements of Star Wars, so was particularly pleased to see this box come out. While I’ve only ever played the Jedi faction in my short history of actually playing this game, I think my favourite faction would have to be Scum and Villainy. Let’s get this out here right now: I am not a Boba Fett fan. Indeed, I feel he has been overused to the extent that all of his original mystique and stuff is completely blown away. Chances are, if I see him crop up in fiction now, I get annoyed. But I am a big Jabba the Hutt fan, and I like the criminal underworld feel of it all. To that, I can add the fact that Scum and Villainy have perhaps the best (certainly, in my view) theme of all six factions: the capture mechanic. Representative of collecting bounties, I suppose, there are all sorts of cards that allow the S&V player to capture cards, which allows you to take an opponent’s unit and place it under your own card, usually an objective (demonstrated in the above shot of the play area, where the captured Jedi unit is held at the ‘Jabba’s Reach’ objective). Captured cards can be rescued by destroying the objective, whereupon the cards return to their owner’s hand. 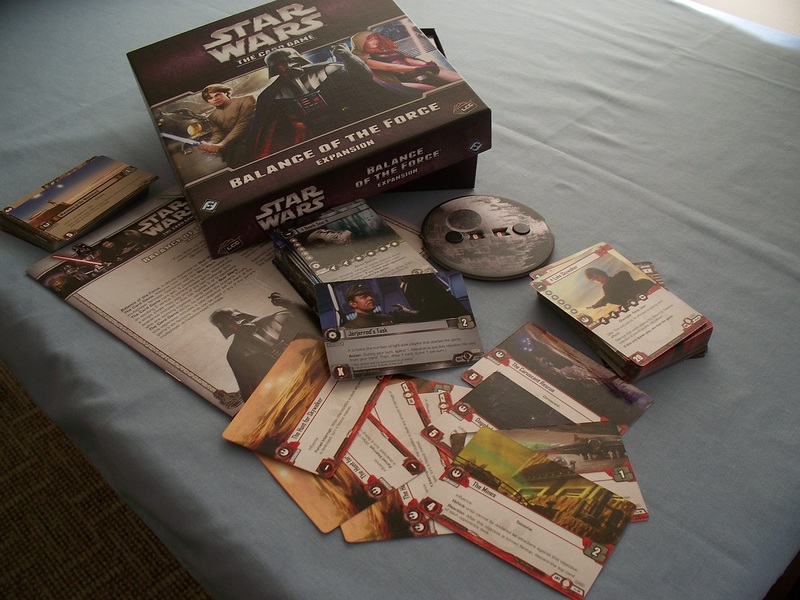 To date, there has been one complete cycle of small, ‘Force pack’ expansions, and two deluxe expansions – the aforementioned Edge of Darkness, and the multiplayer Balance of the Force. The Hoth cycle is the first cycle of six packs, and deals (unsurprisingly) with the Battle of Hoth. There is a really nice area-control implementation here, where certain card effects feed off the number of Hoth objectives you control. The main factions to benefit from this are of course the Rebels and the Imperials, as we see key units and equipment enter the game. However, a nice subtheme emerges in the Scum and Villainy faction, where we get to see more Bounty Hunters and such. The whole cycle is a lot of fun, and deepens the strategy already there in the core set. The Balance of the Force box adds the multiplayer element, where two or three players take on one other player. Because of the perils that might be associated with playing normal decks in this situation, the box gives us the first two Challenge Decks, which I suppose could easily be called overpowered decks, but are only thus to give you a chance against up to three opponents! For the Dark-side player, there’s ‘Jerjerrod’s Task’, which sees you effectively take on the mantle of Moff Jerjerrod from Return of the Jedi and attempt to build the second Death Star. He does this by getting enough resources to bring out the Death Star II card, at which he must then capture each Light-side player’s faction card. For the Light side, ‘The Hunt for Skywalker’ has nine double-sided objective cards, all of which have a common front but different stuff on the back. The Dark-side players are attempting to find Luke Skywalker, which they do when they have revealed the ‘Return to Tatooine’ objective card. Objectives are revealed when they have been damaged to the point they would ordinarily have been destroyed. If they destroy Luke Skywalker, they win; the Light-side player is basically trying to avoid detection, and plays until the Dark-side players run out of cards in their deck (for this reason, deckbuilding is limited to ten objective cards, or fifty-card decks). So yeah, I really like the Star Wars LCG. I mean, I like card games, and I like Star Wars, so it’s kind of a no-brainer, but the mechanics and all the rest of it make it a really good game anyway, in my opinion. It’s significantly different from other games that you feel like you’re having a great experience – playing Warhammer Invasion and A Game of Thrones and Call of Cthulhu, while they’re all really great games, they can tend to be a bit samey. Star Wars LCG stirs things up a lot. Another good point in its favour is its use of original art for the cards. Previous Star Wars card games have used movie stills, which can tend to be a bit boring. 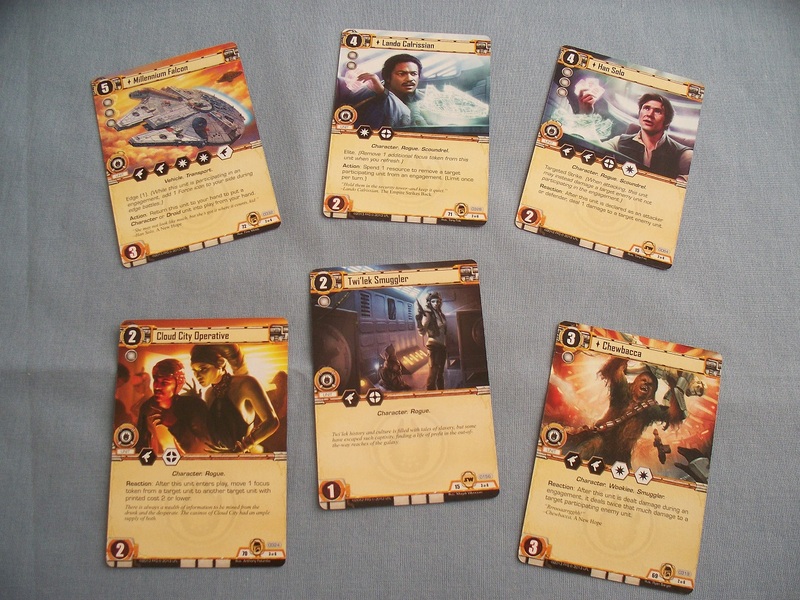 Original art allows the EU to be brought into the game with greater ease, and allows for such awesome stuff as the Smugglers and Spies cards shown earlier, where we can see Han winning the Falcon from Lando. Great stuff! Even if you only buy the core set, I would definitely recommend you check this game out. I think that’s also part of the beauty of this game: with the core set, casual gamers or non-gamer Star Wars fans have got a really great game right out of the box. You have four fully-playable decks right there, and you can have a lot of fun with swapping out some pods for others. A smart move on FFG’s part, the pod structure makes the game appealing to people who want to open a box and play a game, and not spend hours beforehand constructing the perfect deck. Also, the game will run to a maximum of twelve rounds, which can be over in under half an hour, so you aren’t going to be tied down for the whole evening playing one game. 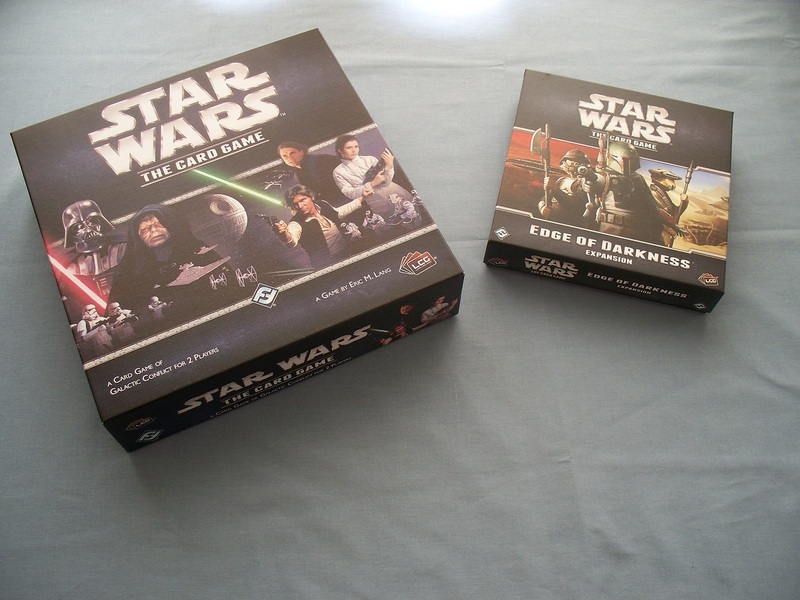 If you want such icons as Chewbacca, Lando, or Jabba, you’ll have to pick up the Edge of Darkness box, which gives you six fully playable decks and enough customizing options to keep you occupied for a long time. The Force packs keep the game constantly evolving, with more stuff coming out all the time. They’re by no means required to play, but they definitely add some spice if you’re getting used to the core set’s offerings. 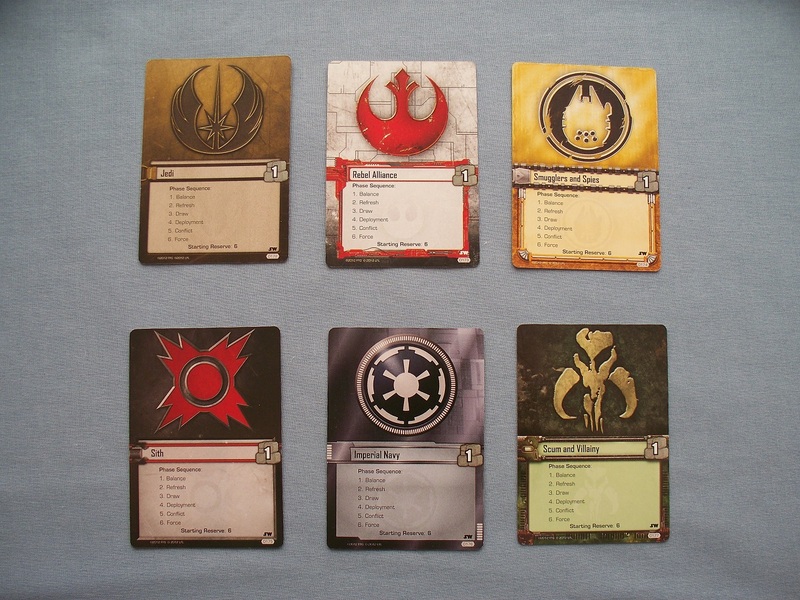 Balance of the Force is probably most appealing if you have a larger group, though it does have cards that can be used by each faction in one-on-one play also. But I definitely recommend people check this game out! Next Next post: A blog for Tuesday!